Is a Visa Buxx Card Right for Your Child? Visa Buxx is a debit card created to give teens spending independence and teach them about spending responsibilities, all while keeping the parents in the know and in control. How does Visa Buxx Work? Visa Buxx is a prepaid card which allows you to reload the card via online or over the phone. This is not a credit card and only money that is prepaid can be spent. The transactions are recorded just like any other debit card so you can review and discuss your teens spending habits with them. In case the card is ever stolen or lost you are not help responsible for any purchases made which were unauthorized. The Visa Buxx card is much safer than your child carrying cash. Plus it is accepted everywhere that Visa Debit Cards are welcome. This card is great for showing your teen responsible spending and budgeting habits. Benefits of using the Visa Buxx Card. Help to Encourage financial responsibility with your children. Easy to use and widely accepted. Safer to carry and use than cash. The Visa Buxx card can be a powerful tool if used correctly. It is important for young people to learn from the beginning how to manage and spend their money wisely. Parental involvement with this card can make that learning curve easier. It is not easy for most adults to learn to be financially responsible, let alone a teen. So all the positive influence they can get at such a young age will help them build a solid financial future. Not only are your teens going to learn some fiscal responsibility, but they will also get a jump start with online budgeting and account monitoring. The Visa Buxx card offers similar online access to that of a normal debit card. Check it out and see if it is right for you right… here. Budgeting Doesn't Have to Be this way. Do you find it difficult to budget? Is it hard for you to continually input the data into your budget form and stay current with it? Does the thought of a budget stress you out? 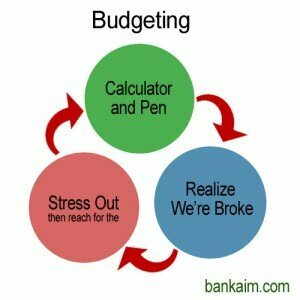 Well for those that have a difficult time budgeting your money here is a method that simplifies the processes. It is called the 2 Account Simple Budget System, and here is how it works. If you do not already have two checking accounts open than head out to a bank and open a 2nd checking account. Use a different bank than the one you are at now. It makes keeping the accounts separate way easier. I have a Chase account and a Bank of America account. These will be your ‘Bills’ account and your ‘Cash’ account. Now the next step is to sit down and take a look at your monthly expenditures. You are going to separate your monthly expenditures into two sections. Bills – These are bills you pay every month and can set up on automatic withdraw from your bank account. Like mortgage or rent, utilities, cell phone, monthly giving, (and ideally savings). 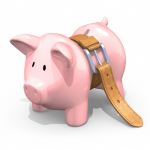 Needs and Wants – Needs and Wants are everything else you spend money on that you need or want. This is food, clothes, entertainment, household items, etc. Now to execute the plan. For this example the Chase account will be the ‘Bills’ account and the B of A will be the ‘Cash’ account. Bills Account: Once you determine how much you need in your Chase ‘Bills’ bank account every month you are going to deposit that much plus a little extra into that account each month. You want to deposit a little extra in that account each month to insure you do not overdraft at the end of the month. Some bills, like utilities, fluctuate each month so use a high estimate and deposit about $100 extra each month into the account. Remember you can always withdraw that extra at the end of the month if you didn’t use it. Cash Account: Now you are going to deposit the rest of your money into the B of A ‘Cash’ account. The next step is to take that Chase debit card, the account you use for your Bills, and put it in the bottom of your underwear drawer. This account NEVER gets used except to cover the routine monthly bills. It is best to have EVERY SINGLE bill set up on automatic bill pay. Then you never have to worry about paying them on time or forgetting. Plus, you will never have to worry about accidentally spending the money for bills on something else that month, because the Bills money gets put in the Bills account first. Now you are left with just the ‘Cash’ B of A account which you can budget into smaller categories or spend wisely throughout the month. Since we also include savings and routine giving in the Bills Account you do not need to worry about that your cash account may be getting low by the end of the month. Now lets apply some numbers to this system. Hypothetically lets say you have $2,450 that you need to deposit into you ‘Bills’ account. The breakdown may look something like this. This money never gets touch by you, and all your bills get automatically paid out of it each month. That is stress free bill paying. If you get paid every 2 weeks then split the figures in half and deposit that much each paycheck. This system works as a light budget. It will get you on the road to knowing where your money is being spent and being sure you have the money in the right spots to pay your bills and feed your family. If you have a hard time budgeting try this 2 Account System to get you started.